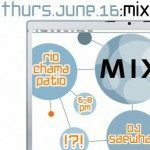 MIXSANTAFE.COM is the official unveiling of the new MIX website–the place for planning projects, supporting entrepreneurs and ideas and getting involved with the things and people that feed you and need you. It also happens to be the unofficial unveiling of a long, hot summer of patio parties–so it’s no accident that we’ve teamed up with the crew at Rio Chama: They know how to dish up the grub and chill the cocktails on the restaurant’s perfect patio. Mixed drinks will be courtesy of Silver Coyote Whiskey. Food will emanate magically from the ridiculously delish Rio Chama kitchen. DJ Saewhat will physically crack your dance pelvis with mellow, but imminently groovable tuneage. Interactive web stations will let you check out the MIX site at your leisure. Reminder: JUNE 16 is the deadline for entries in the Mobile App Challenged–more than $6,000 in cash and prizes. Plus, a new challenge will be announced…which mean someone’s eventually going to end up staring down the barrel of cash in exchange for their concept.